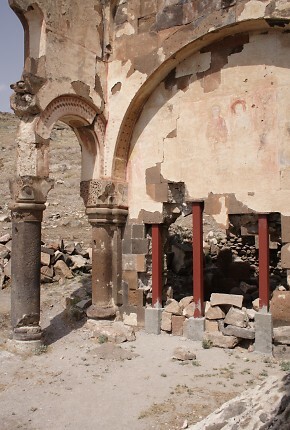 Armenian Architecture - VirtualANI - Damage to Ani between 2007 and 2008. 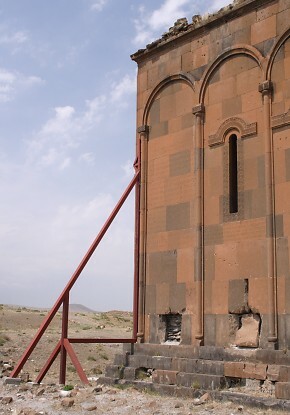 In the 1990s, the Ministry of Culture and Tourism of the Republic of Turkey was responsible for a "restoration" of the defensive walls of Ani that inflicted irreparable damage to them. 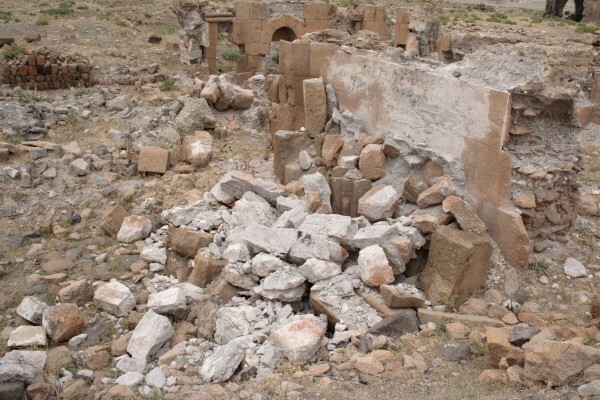 In 2008 the Ministry of Culture renewed its destructive activities at Ani. Buildings throughout the site suddenly sprouted steel columns painted bright red. Ostensibly these columns are to help support and preserve the monuments. In reality they do no such thing - they are a visual disfigurement and in some cases have done actual damage to the structures. 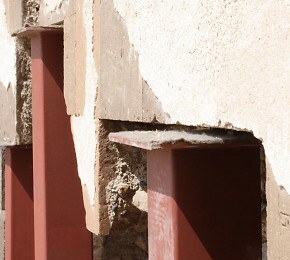 The columns may be part of a deception to persuade visitors to Ani that actions are being taken to preserve the monuments. If, however, they are genuinely intended to help preserve the monuments, then their use demonstrates an astonishing lack of understanding about the structural identity of those monuments. 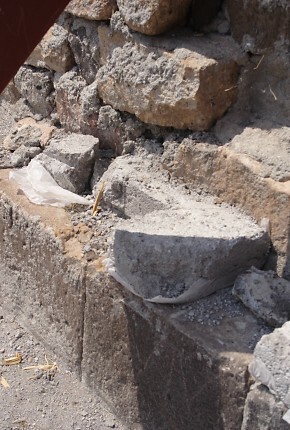 The churches at Ani have a solid concrete core (composed of lime cement, gravel aggregate, and tufa rubble) with outer and inner facings of volcanic tufa that are embedded into the concrete core. 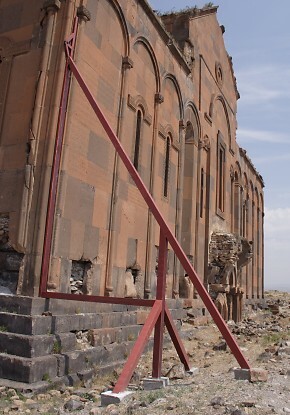 This results in a monolithic structure that can withstand compression and tension and which is extremely resistant to collapse: a church can remain upright even if 70% or more of its lower walls have been lost (as an example see the St. Sargis church at Khtzkonk). The facing stones perform only minimal load-bearing functions - their true function is to protect the concrete core from damage. 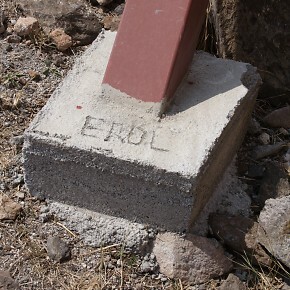 It is the concrete core that supports the building. All of the steel columns have been placed underneath facing stones - stones that do not actually support anything! To make matters worse, the steel columns stand on concrete cubes that have no foundations and rest directly on the ground. Thus, even if they were attached to the concrete core, they would be incapable of supporting any weight. Some of the columns have even failed at supporting their own weight, and have fallen over. The facing stones and the concrete core work together. 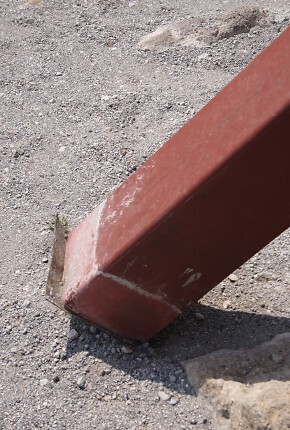 If facing stones are lost, the structural integrity of the concrete core will quickly become compromised as a result of damage caused by weathering, water penetration, and invasive plant roots. 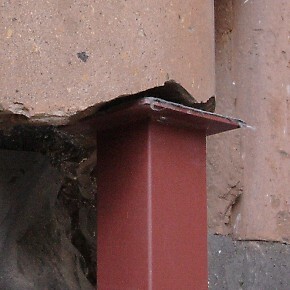 If large areas of facing are lost, this will eventually weaken the concrete core enough to cause the building to collapse. At Ani there has been a massive amount of stone robbing, an activity that continued until recent decades. At the start of the 20th century Nikolai Marr recognised the risk that this loss had created. He attempted to repair the damage by replacing missing facing stones in the lower courses of many of the churches. 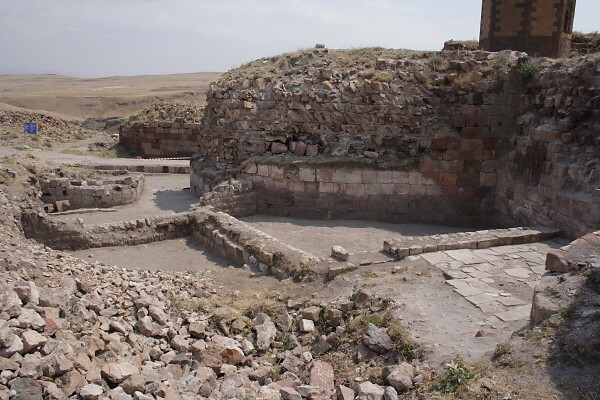 Those repairs were destroyed after control of Ani fell to Turkey, resulting in the eventual collapse of most of the repaired buildings. The following photographs do not show all of the monuments affected by the steel columns. For example, the Georgian Church is now encased in a structure that resembles a giant spider. The Lion Gate has a flimsy inner arch made of steel - it is fixed to the underside of the original arch using bolts that have been drilled into its voussoirs, splitting a number of the stones. The original arch was in no danger of collapsing until the drilling weakened the integrity of the stones within it. 1. & 2. Steel columns on the outside and inside of the Church of the Abughamrents. 3. & 4. These photos reveal how insubstantial the foundations of the steel columns are. 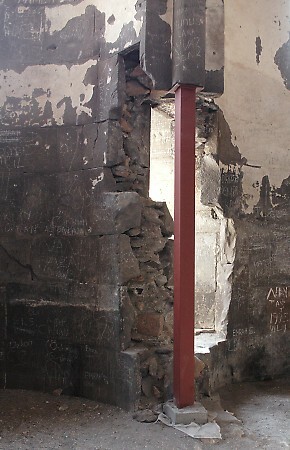 A column has fallen off its concrete base and now leans against the church. 5. & 6. This is the biggest arrangement of steel columns - it rests against the western end of the Cathedral's south façade. It performs no useful function - the façade at that location is still perfectly vertical and structurally sound. Around the corner, on the west façade, there is structural damage - the whole façade has started to lean outward. If the steel support had been placed at that location, and had been given proper foundations, then it might serve some purpose. 7. The steel supports sit on concrete cubes that rest directly on the surface of the soil. The lack of foundations means that if any substantial weight were put on these cubes they would either sink into the ground or slide across it. 8. 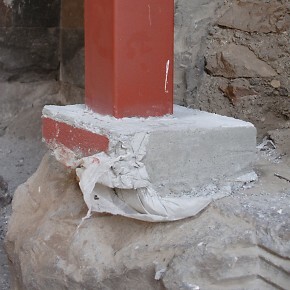 The base of this colonnette has been damaged during the placement of the column. 9. 10. 11. Steel columns have been inserted at ludicrous locations inside the Cathedral. They have been added to piers that are structurally sound and "support" stones that are in no risk of falling - stones that are still firmly embedded into adjoining masonry. 12. & 13. The columns have all been embedded into laughably weak foundations, and in many cases they do not even touch the stones they pretend to support. 14. & 15. 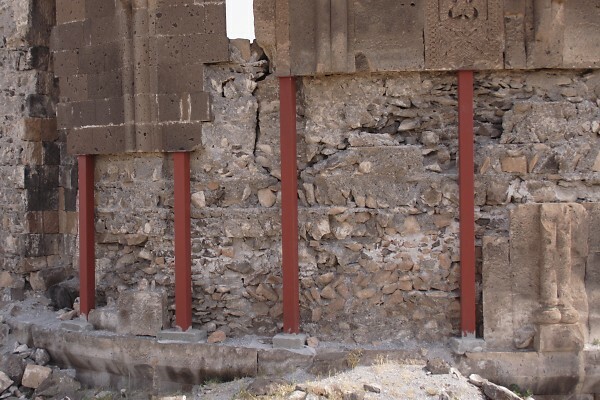 The exterior of the Tigran Honents Church now boasts a set of three columns - they stand on concrete bases that have no foundations, and they do not even touch the undersides of the wall they are supposed to be supporting. 16. & 17. 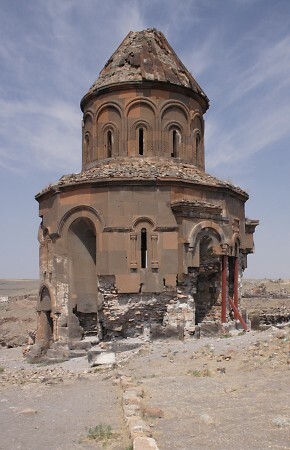 The Church of the Redeemer is the structure at Ani that is currently at most risk of collapse. In 1912 Nikolai Marr undertook essential repair work that he hoped would ensure its continued survival. This consisted of replacing large areas of missing facing stone. 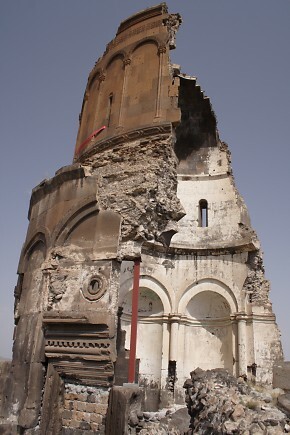 After Ani became Turkish territory, Marr's restoration work was destroyed. Half of the church collapsed in the 1950s and the surviving half was further damaged in the 1988 earthquake. The steel column standing on the doorjamb serves no real purpose - when the structure above it falls, it will fall with or without this column. 18. These four columns serve no purpose because they are only supporting facing stones, not load-bearing structure. The missing facing stones were part of the repair by Nikolai Marr. 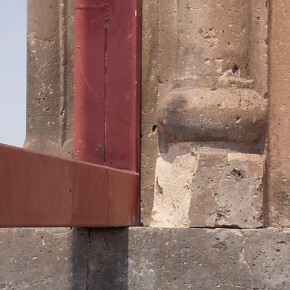 A small section of his repair survives above the left two columns (the stones he used are smaller in size than the original masonry). 19. & 20. A belt has been placed around part of the drum of the dome. It is a single strap, twisted into a figure-of-eight shape. The belt flaps about loosely in the wind - note the marking where the steel tie has been scraping against the stone of the colonnette. The theory seems to be that the strap will help hold together the two parts of the drum which are separated by a crack. In reality, the belt will have no effect in supporting the structure, will do nothing to prevent a possible collapse of the dome, and might serve to make the resulting damage worse: tying the two sections together will ensure that if one were to collapse it would tear down the other. The activities of treasure hunters continue, but on a smaller scale than in 2007. Damage caused by the decay of the monuments also continues. 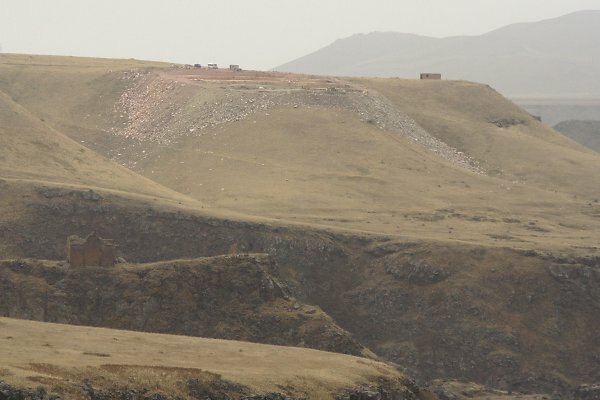 The quarry over the border in Armenia still operates, and the area worked has been expanded after a new quarry-site was opened. 21. 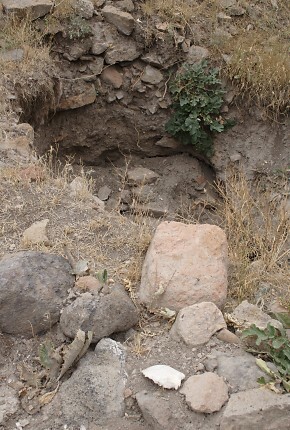 A grave near the "Red Church", dug up by treasure hunters. The white object at the bottom of the photo is a fragment of a human skull. 22. 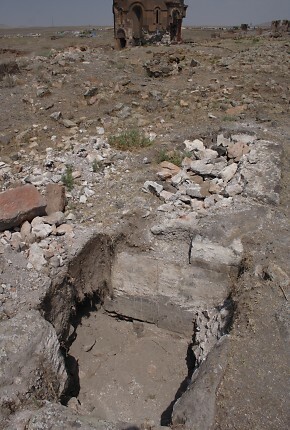 Foundations of an unknown structure located near the Church of the Abughamrents, dug up by treasure hunters. 23. 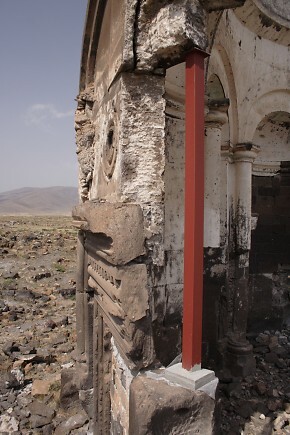 The south facade of the "Red Church" collapsed between 2007 and 2008. 24. Between 2007 and 2008 a new quarry was started on Armenian territory, behind the Kizkale promontory. There is an old settlement site visible just below the quarry. 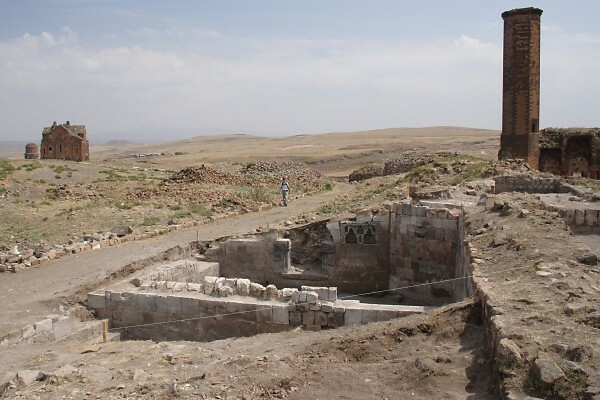 In 2008 a team of Turkish archaeologists undertook excavations at various parts of Ani. They were led by Yaşar Çoruhlu from Mimar Sinan University in Istanbul. 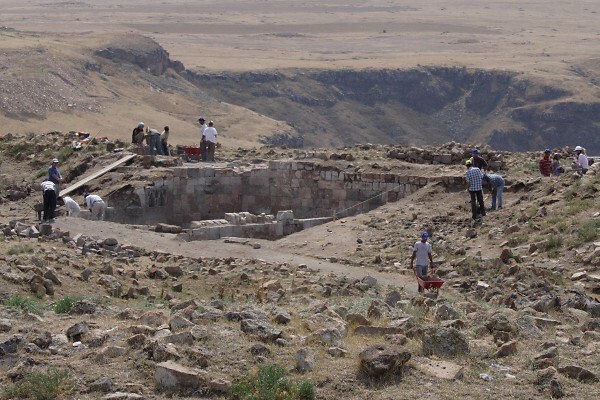 The activities of Turkish archaeologists at Ani over the last two decades have inflicted considerable damage to the site. Until evidence indicates otherwise, it is appropriate to flag the 2008 archaeological activities as possible damage. 25. 26. 27. Most of the excavations were concentrated on the area around the base of the wall of King Ashot. In this area two sites were excavated, one was located at the eastern end of the wall, beside the mosque of Minuchihr, the other was located midway along the length of the wall. 28. 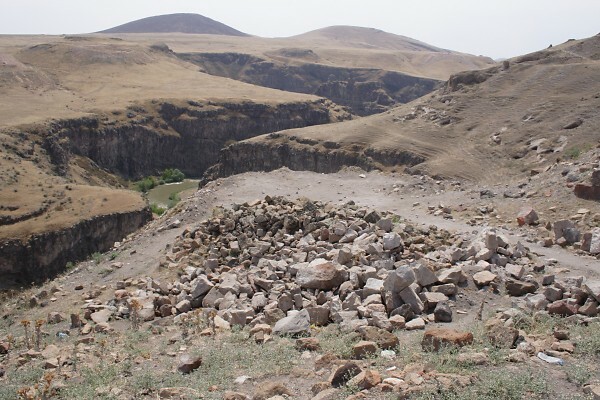 As with previous years, the spoil from the excavations was tipped over unexcavated areas of Ani, contaminating those areas for future serious archaeological investigations. This page [destruction at Ani, 2007-2008] was first published on the 2nd December 2008 and was last revised on the 9th December 2008.